Why do you fear the future consequences of giving the government more power to conduct surveillance on your fellow Americans, but not the power to strip them of their citizenship? Why do you fear the militarization of state and local police forces, but not the ability of the federal government to revoke the citizenship of those accused of being terrorists? Why do you fear a federal government that has shown its desire to chip away at the Second Amendment, yet you believe it would judiciously use the power to abort a man’s citizenship? Why should the bar for ending a natural born American’s citizenship be lower than the bar used to try him for treason? When an American is accused of committing a treasonous act, then you try him for treason in a court of law. You don’t set up a system where his citizenship is arbitrarily revoked and then instruct the U.S. military and the intelligence community to find him and drop bombs on his head. The last person convicted of treason was Tomoya Kawakita, a Japanese-American sentenced to death in 1952 for tormenting American prisoners of war during World War II. Even such a clear-cut case created qualms; President Eisenhower commuted Kawakita’s sentence to life imprisonment. The difficulties of meeting the tough constitutional standards — two witnesses or a confession in court to “levying war” against the United States — help explain why treason is rarely prosecuted. The framers of the Constitution crafted the narrowest definition of treason known until that time because they sought to protect Americans from the blunt instrument that European rulers had used against political enemies. 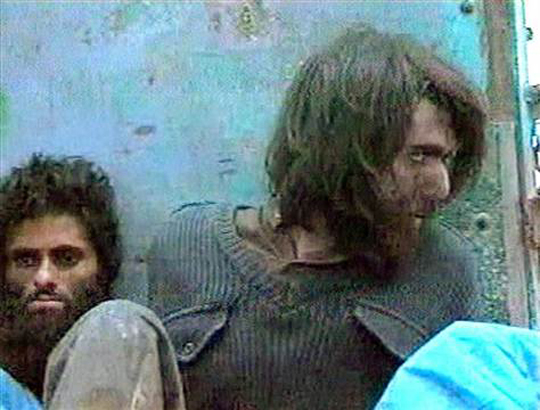 The CBS piece came out as the United States was trying to figure out what to do with John Walker Lindh. For those who don’t remember, he was part of a 2001 Taliban prison uprising in Afghanistan that killed CIA officer Mike Spann. Even Lindh wasn’t tried for treason. Instead, he pleaded guilty to one count of supplying services to the Taliban and a lesser criminal charge involving the weapons he was carrying at the time. The “American Taliban” was sentenced to 20 years in prison for his crimes against the United States. Would you elect a man president who, in his zeal to punish treasonous Americans, engineered tools to be favored by future tyrants? Sen. Ted Cruz and his supporters are playing with fire. The track record of giving the federal government more power indicates that future generations of innocent Americans will get burned if his plan succeeds. What do you think about Vox’s opinion here? It’s not a “good” idea at all. It’s a horrible idea. His point about using such a rule to dodge IRS fees incurred when one renounces U.S. citizenship is a cute joke on some level, but the bill isn’t a laughing matter. Ted Cruz is serious about this thing — and that is scary. True, I highly doubt it will go anywhere…but he’s still someone who appears ready to run for president. I do not want a man who would propose such a thing to ever be the president of the United States. Yeah… Vox Day is pretty loopy, I have to admit. Sure, I agree on a lot of what he says, but this? The guy considers himself a Libertarian, yet he has NO PROBLEM with Cruz giving the government THAT KIND of legislation? A friend of mine sometimes shares his stuff. I don’t normally check him out on my own. Like I said, I’m not sure how someone can just shrug their shoulders and say, “Yep. Sounds like a good idea to me,” without thinking about how politicians 10, 20 or 30 years down the line will use the power that’s been given to them. I had to reread this a few times because I wasn’t expecting to agree with you on every point. I just don’t see the benefit from stripping their citizenship in this case. Things like this seem to be a slippery slope and I would tread carefully before making a move like this. This is a tough one for me; my gut reaction is similar to Cruz as far as citizenship goes. I believe Magnetc Eye voiced a similar position about Austrailian people going to support ISIS type movements in a post a few weeks back. You do bring up great points on the arbitrary-ness of implementing such a law and those in power taking advantage of it. If one makes the choice to go abroad and support these “movements”, they run the risk of a bomb on their head….however where are we as a society when our citizens don’t get a fair trial. Great thought provoking post! I think if a U.S. citizen is over in Syria fighting on behalf of Islamic State and he dies from a U.S. airstrike with his jihad buddies, then that’s his fault. However, I think that if circumstances allow for him to be captured and tried for treason (e.g., he’s apprehended while in Britain or found to have re-entred the U.S.), then he needs to be tried in court. I don’t even know how that would work to essentially make a U.S. citizen “stateless.” If someone was born in the U.S., then I think doing something like that would require consent on their part. At the start of the Syrian civil war there were U.S. politicians who advocated for arming the same people who morphed into Islamic State. What if John McCain’s constituents went over there to help the “rebels” John McCain was in favor of arming, the guy got over there, and then the Obama administration decided strip the guy of his citizenship a year later because the political winds had shifted? What if you worked for the intelligence community and you witnessed officials committing war crimes? You wanted to expose their criminality, but were afraid to because with all your interactions with shady organizations over the years it wouldn’t be very hard to convince Sen Ted Cruz and powerful members of “Committee X” that you had switched over to the other side. Suddenly the whistle-blower has lost his American citizenship and the due process that the Constitution affords him. Obama should be tried for treason, since it’s his regime that worked with gulf states, like Qatar and Saudi Arabia, to arm these psychotic jihadists against Assad in Syria. I’m sure readers of this insightful blog would be in support, right? You’re back again? I thought Doug had banned you. I see you haven’t changed one bit, Reptile Boy, leading off with your sarcastic insightful blog zinger. It’s a lot more insightful than your conspiracy-laden, anti-American garbage, that’s for sure. why do you think I’m being sarcastic? Obama should be impeached. US citizens have been killed with drone strikes, wars have been waged without Congressional approval and our constitutional rights have been systemically violated by the NSA. as for Ted Cruz, why can’t he deported back to Canada? Pro tip: If your first comment back after a month of being banned is to start making sarcastic comments about the “readers of this insightful blog,” then you’re probably not going to get too many people who are interested in speaking with you. Note to the anti-TSA guy: If you’ve never commented on my blog before, and your first comment is to plug your Facebook page, then your comment will be deleted. What about plugging your new sci-fi magazine entitled Sci-Phi if you’re looking for libertarian, conservative, and religious writers for it? I’d be much more tolerant of you doing something like that once or twice, given that you’ve actually taken part in multiple discussions. Although I would still prefer that it was worked into the conversation naturally instead of just a jarring plug that comes out of nowhere. Truthwillwin1 has plugged some of his work in relevant blog posts and I have said nothing about it. I would do the same for you unless it just got out of hand. Guilty, but to be fair I try to only plug when they are on topic. My goal is to add to the discussion, the additional blog hits are just a bonus. To answer Lizard: No, I might not agree with many things the president has done and I think he walks a fine line but I would not go as far as having him tried for treason. A common problem I find with certain people is that they think they can predict everyone’s views and they often are wrong. No need to say “guilty,” Truth. 🙂 I’m totally cool with you sharing your blog post on occasion because, like you said, you try to add to the discussion. Hey Doug, what do you think of this statement here? “I am an attorney, and so I am unduly impatient when know-nothing blithermouths attempt to explain legal matters to me where I am an expert and they are an ignoramuses. I would at least like the courtesy done me that the blithermouth read up on the issue before holding forth his ignorant layman’s blither. As a matter of fact, striping the legal protections of citizenship of men who serve in the enemy military service in time of war is routine, and not a matter of controversy at all. See, for one example of many, the Nationality Act of 1940, Public Law 76-853, 54 Stat. 1137, holds that service in a foreign military when coupled with citizenship (and this is not even a military of an enemy nation at war) is sufficient grounds for citizenship to be revoked. See also Ex Parte Quirin, 317 U.S. 1 (1942) were normal constitutional rights to trial and so on were denied enemy combatants despite their being US citizens. The upshot of this is that revoking citizenship for enemy combatants is already the law of the land and always has been, in this and every nation covered by Common or Civic Law. It would be controversial to oppose such a plan, or, rather, utterly unheard-of, or, rather, totally and utterly bat-guano insane. No prince and no parliament in the history of the world has ever extending citizenship rights to soldiers of an enemy in time of war. So, like moving to Italy, this is not a controversial nor fringe opinion. Sen. Cruz’s proposal — if I understand it — was not legislation to strip citizenship from men who join the military of the Islamic State – as I said above, that is routine, and requires no additional actions from Congress – the legislation was merely to beef up security border processes to prevent such men from sneaking back into the country. Since when did you talk to Jonathan Gruber’s brother? Interesting timing. Although rare, it is possible for a naturalized U.S. citizen to have his or her citizenship stripped through a process called “denaturalization.” Former citizens who are denaturalized are subject to removal (deportation) from the United States. Natural-born U.S. citizens may not have their citizenship revoked against their will, but may choose to renounce their citizenship on their own. I linked to the Hotair Story in my original piece as well. See, for one example of many, the Nationality Act of 1940, Public Law 76-853, 54 Stat. 1137, holds that service in a foreign military when coupled with citizenship (and this is not even a military of an enemy nation at war) is sufficient grounds for citizenship to be revoked. Your egghead lawyer friend should look at the transcripts from Yahoo’s lawsuit on NSA spying. Read how the judges brushed off their constitutional concerns. Now ask yourself if you want those guys in charge of revoking citizenship for Americans without a trial. Where has Mr. Cruz’s proposal gone since it first generated news? Nowhere. That’s because sane people know that you don’t want to lower the bar when it comes to such drastic measures. You don’t need to be a lawyer to understand that. “I am a little puzzled as to why you are continuing to leave comments on my blog. I have asked you politely not to do so. As for your attempt a legal argument, you are wasting my time and yours. The definitions of what constitutes a state and what the procedures are for losing citizenship are well defined in law. I am astonished you would think the ignorant, sloppy, uninformed opinion, uttered in tones of contempt toward an expert brings you some sort of honor rather than shame. Go talk to a NASA rocket scientist, and tell him that rockets will not fly in space because there is no air for the explosions to push against. Okay, so… who should I believe in this situation? You’re an adult. You don’t need me to tell you who or what to believe. I’m confident you can come to your own conclusions.